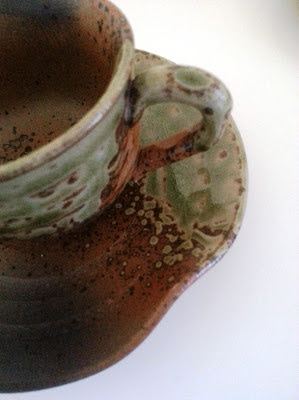 I'm particularly fond of the little dip in the saucer which makes the most perfect 'handle'. Four dollars a pair, local op-shop. I only wish there were more of them, and that I knew who made them. 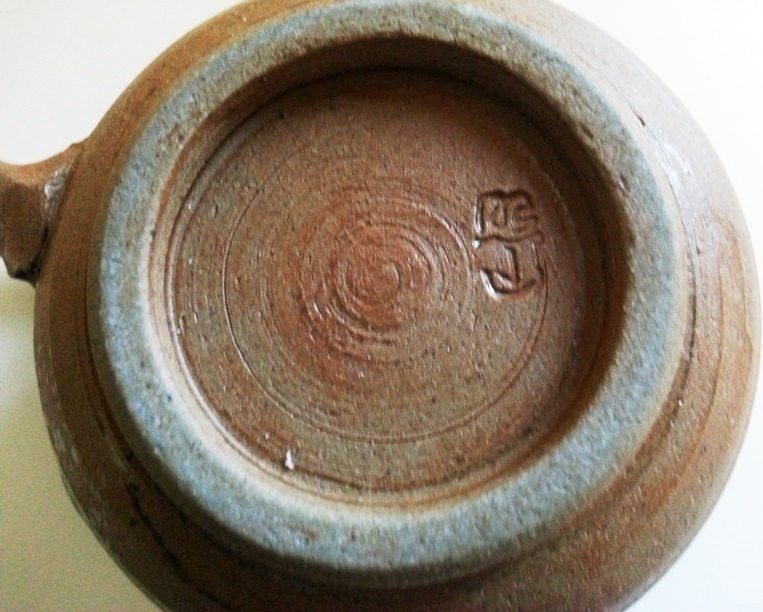 Here's the potter's mark - perhaps somebody out there can help me identify the artisan who turned a lump of clay into something so beautiful. And useful. So beautiful.....the creative hand that produces an object to admire. Those are so beautiful. 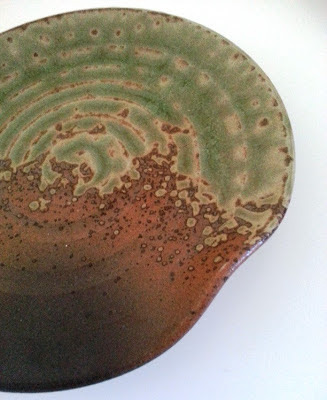 Maybe Ray at Retro Pottery Net or Esa at The Ridou Report can help you identify them. I love the colors, and that little dip is such a wonderful touch. 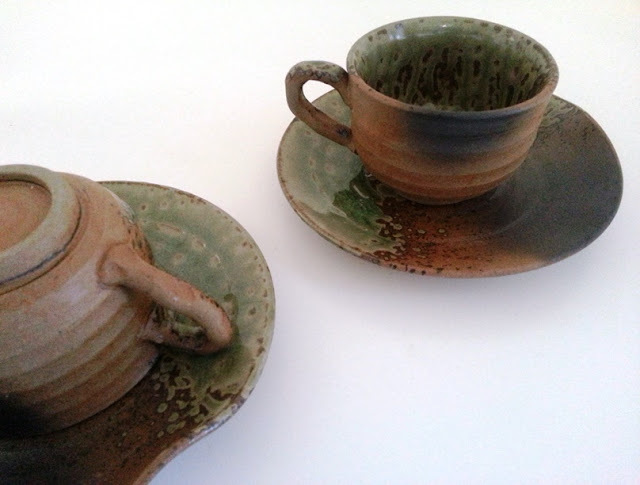 Those are lovely, rustic in a really homely way - perfect to sip a lovely cappucino from! They're beautiful. I wish I were a potter. I'd wear a head scarf and an a-line denim skirt and clogs. OK so now I'm believing you are a witch and can conjour up seeming endless cupboard space. 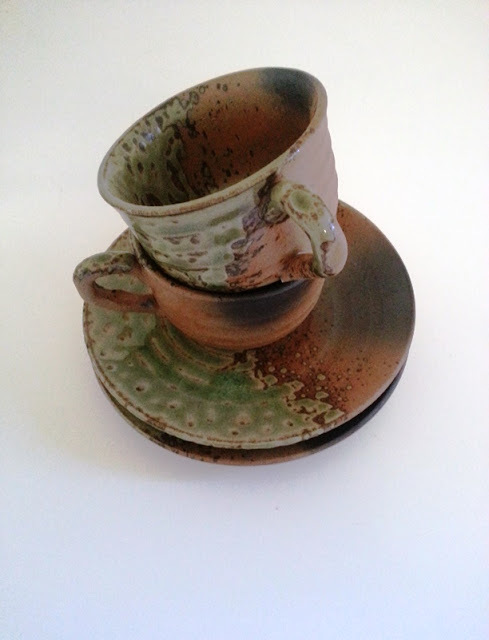 Who has space for MORE cups and saucers? Not moi. Saying that, I do love those and can just imaging a quality flat white in one with a nice piece of something chunky and a bit wholesome (but not too wholesoome) on the side. Enjoy. Ooh, these are unlike anything I've seen- which makes them very interesting! And beautiful! I love the close-up of the saucer, the way those two colors meet is just gorgeous! I hope someone can help you find out who the maker is, I'm very curious too! The irregularly shaped saucer is the best. For sure.